Israeli snipers have been shooting Palestinian protesters within the Gaza Strip, claiming that, in doing so, they are protecting Israel’s borders and sovereignty. Is their claim genuine? 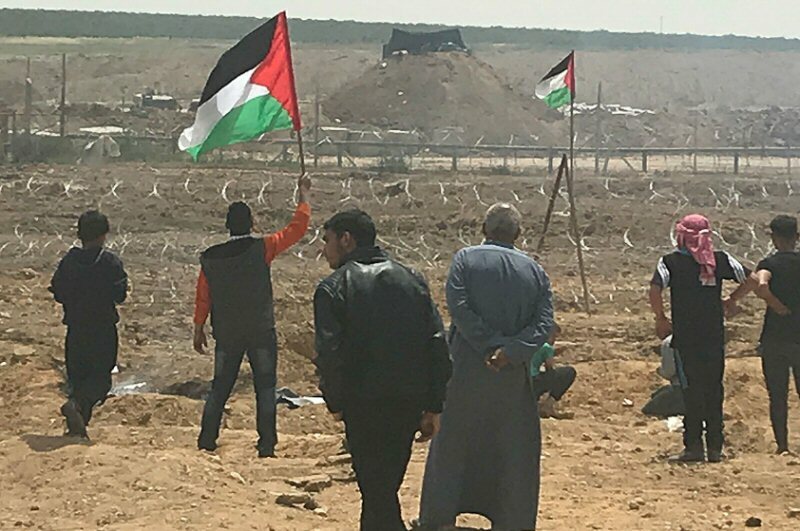 Since 30 March, hundreds of Israeli soldiers, including a reported 100 snipers stationed along the eastern border of the Gaza Strip, have been shooting at unarmed Palestinian protesters who are taking part in the activities of the Great March of Return and Breaking the Siege. According to the Ministry of Health in Gaza, they have killed 46 protesters and wounded around 8,000 others, including 25 who have had at least one of their limbs amputated. The snipers have been shooting mercilessly at Palestinian women, children and men, young and old alike, with no consideration for international laws and conventions. They completely ignore calls for them to stop their brutal crackdown on the 2 million people besieged in the tiny coastal enclave. Human rights groups in Palestine, Israel and other parts of the world, including Amnesty International and Human Rights Watch, as well as UN officials, have accused Israel of using lethal force against the Palestinians in Gaza. Amnesty has twice called for an international arms embargo on Israel to deter its brutal targeting of unarmed civilians. Meanwhile, Israeli officials have defended their snipers defiantly, despite the fact that they have killed and maimed civilians who were merely exercising their right to demonstrate in their own land, while calling for the implementation of a UN resolution granting them the right to return to their land; it’s a resolution which the international community has failed to implement for 70 years. Netanyahu’s words of praise were among many spouted by officials and members of the public in Israel. The shootings have been under the pretext of protecting Israel’s supposed borders, but since its creation on Palestinian land in 1948, Israel has never identified its borders; it is unique among UN member states in that it has never declared its borders, giving the game away that Israel is an expansionist, colonial state. Nevertheless, the so-called Green Line — or the Armistice Line — which is the demarcation line set out in the 1949 Armistice Agreement that ended the war between Israel and the Arab states of Egypt, Jordan, Syria and Lebanon, has become the de facto border for the occupation state. The Armistice Agreements did not dictate that the demarcation line was to be a permanent border, though; it was intended to serve as a temporary border line until a permanent agreement could be reached. The Armistice Agreement with Egypt stated quite categorically that “the Armistice Demarcation Line is not to be construed in any sense as a political or territorial boundary.” That the Armistice Line does not give or deprive defence forces of any right to the disputed land was set out by renowned Palestinian researcher Dr Salman Abu Sitta in an article published in October 2010. Hence, even if we agree that the snipers are protecting Israel’s border, they must have been stationed more than three kilometres and at some points five kilometres back from the fence that they actually claim as the border. Abu Sitta revealed in his article a secret deal signed between the Israeli occupation authorities and the Egyptians on 22 February, 1950 that changed the Armistice Line, but this is still illegal because it was a violation of the UN Security resolutions related to stopping the war between Israel and the Arab states. In addition, if we assume that the existing fence is the real border, the Israelis, according to UN Resolution 194, are not entitled to prevent the Palestinian protesters to get close to the border — where they would in any case still be within Gaza — and even cross it because this resolution, which has been reaffirmed by several subsequent Security Council resolutions, stipulates that “refugees wishing to return to their homes and live at peace with their neighbours should be permitted to do so at the earliest practicable date.” International law gives the Palestinian refugees the right to return to their homes regardless of borders, fences or whatever. As such, if the Palestinians are not violating any article of any international laws, while the Israelis are, when will the world wake up and stop Israel’s brutal violations and help the Palestinians achieve their freedom? Those snipers who are shooting unarmed Palestinian civilians are not protecting their border; they are challenging international law. They should be stopped.